Editor's note: This article originally appeared in the Deadball Era Committee's November 2016 newsletter. Click here to read more newsletters from the Deadball Era Committee. Lyle Spatz and Steve Steinberg are among the Deadball Era Committee’s most accomplished members. Baseball historians and authors, they have not only garnered recognition in their own rights, but collaborated on two award-winning books about New York baseball in the post- World War I era. 1921: The Yankees, the Giants, and the Battle for Baseball Supremacy in New York, was the 2011 winner of the prestigious Seymour Medal for the year’s best work on baseball history or biography. 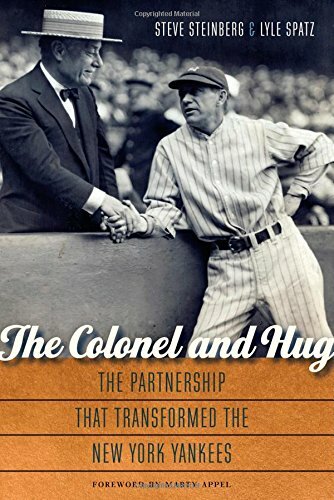 This year, The Colonel and Hug, their dual biography of Yankees owner Jacob Ruppert and manager Miller Huggins, was a SABR Baseball Research Award recipient for outstanding research project. If you have not yet read these two exceptional books, we urge you to do so. Even Yankee-haters will find them highly informative and interesting reads. One of the distinguishing features of the Spatz-Steinberg books is their seamless narrative voice. Although either Lyle or Steve had to put a particular sentence, paragraph, or chapter into words, it is near-impossible to tell who wrote what. 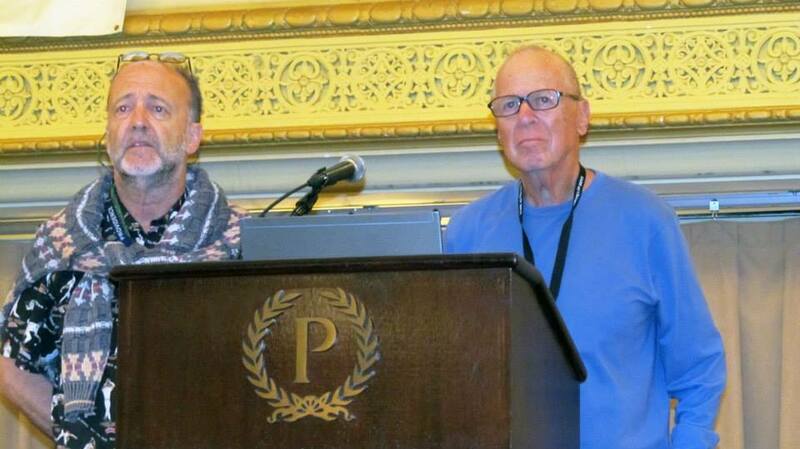 Recently, the authors responded to questions about their collaborative process posed by newsletter editor Bill Lamb. QUESTION: Do you recall when/where/how you first met? LYLE: I would say some time after the turn of the century, although I still think of 1900 when people use that term. It was at a SABR convention. I don’t recall if we were introduced by someone or introduced ourselves. STEVE: We met at a SABR convention in the early 2000s. I joined SABR in ’99 and attended every convention starting with Scottsdale that year, except for West Palm in 2000, and Miami this year (which I was planning to attend until my dad took ill and passed away). QUESTION: Given your recognition as baseball historians and authors individually, what prompted you to collaborate on a book project? Who first broached the idea? And why did you choose the 1921 NY Yankees/NY Giants baseball season as your first joint writing venture? LYLE: Let me answer these questions together. I’d written a couple of books on Yankees’ history, and I had it in the back of my mind to write one on the 1921 Yanks winning their first pennant. My memory gets a bit hazy there, but because I knew Steve was a Yankees’ historian, I remember casually mentioning it to him in the early 2000s. At the 2005 SABR convention in Toronto, Steve asked me if I was working on the ’21 Yankees book. He said he was thinking of doing one, but if I was doing it, he would move on to something else. I said I really hadn’t done anything on it, and if he had started researching it then he should go ahead and write the book. I’m not sure who suggested we work on it together and expand it to include the Giants, but we both agreed that would make a much better book. STEVE: Actually, in the very early 2000s, I had done very little writing on baseball history. I published my first article in The National Pastime in 2000. It was about Yankee pitcher Urban Shocker’s quest for free agency in the fall-winter of 1923. Lyle had a long and impressive resume of publications by then, including two books on the Yankees. For at least a couple of conventions, we talked about the fact that no book had been written about the Yankees’ first pennant. Lyle and I would each say to the other, “You should do that book,” and “No, you should do it!” Then we learned the NL pennant race that 1921 season was dramatic too. And we soon realized the wonderful conflict (which makes for great story-telling) between these two New York clubs that were battling for the hearts and minds of New Yorkers. QUESTION: Once the subject was selected, how did you divide the labor of original research? Did one of you take the 1921 Yankees, the other the Giants? Or did you both research the clubs individually and then pool your findings? LYLE: This was an easy decision. Steve had written extensively on this era in Yankees’ history, and I was the one more familiar with the Giants and the National League. So we decided in the first minutes of our chat, that Steve would cover the Yankees and the American League race and I would cover the Giants and the National League race. Steve was more conversant with some topics, like Judge Landis and the Black Sox Scandal, while I was a bit more familiar with others, like New York City history and geography. Other areas that cut across both leagues, like the run-up to and the playing of the World Series, we covered together. STEVE: The secret will now be told. Yes, I focused on the Yankees and Lyle on the Giants. Each of us did the first draft of “his” team’s chapter. We then began a process of exchanging edit after edit back and forth. QUESTION: In a previous interview, you stated that collaboration in the digital age is a relatively smooth process, notwithstanding the great geographical distance that separates you. [Note: Lyle resides in South Florida, Steve in Seattle.] Once your initial research was completed, can you explain the process by which that research was transformed into prose? LYLE: No matter what Steve wrote or I wrote, the copy went back and forth between us many, many times until we were satisfied. As you noted, Steve lives in the Northwest corner of the country and I live in the Southeast corner, but the exchange of drafts, questions, corrections, etc., were accomplished just as if we lived next door. Well, not exactly. It would have been nice to take some physical copy and be able to discuss it over a cup of coffee. In the early days of our collaboration we floundered a bit on logistics and were aided greatly by Steve’s friend, Jennifer McCord, a Seattle-based publishing consultant. After looking at some preliminary chapters, Jennifer convinced us that we could indeed “speak in one voice,” a goal we very much wanted to accomplish. She continued to provide guidance and encouragement throughout, and we are very grateful to her. Collaborating on a book with someone you see maybe once a year presents some interesting challenges. In addition to the three-hour time difference, we have much different body clocks. Steve is a night owl, and I’m an early riser. I believe many days he was going to bed shortly before I was waking up. Although this occasionally caused lag time in our communications, it was not a serious problem. We also have different personalities. Steve is a Type A and I’m a Type B. This is not a bad thing. Many tasks got done because of Steve’s dogged persistence, tasks that I’d still be ruminating on. Conversely, I hope that from time to time I served as a calming influence. Moreover, we never had a serious disagreement on any phase of the project. We began as acquaintances and ended as friends, something Jennifer has told us doesn’t happen very often. STEVE: I’m a night person while Lyle is an early riser. I would often send him an edited chapter at 3 a.m. my time, when I was going to bed, just as he was getting up at 6 a.m. in Florida. We did indeed have to come up with a procedure for our collaboration. There was some trial and error at first, and no doubt my friend Jennifer McCord helped us greatly in the process. I don’t want to skip over the research. One thing that makes our books special is that we draw on countless newspapers, most of which are available only the old-fashioned way, by working microfilm. We probably examined ten or so New York City papers, plus some from other cities. The vivid writing of their reporters is sprinkled throughout the books. We pride ourselves in drawing primarily from contemporary (to the era we are writing about) sources and not from books written decades later. 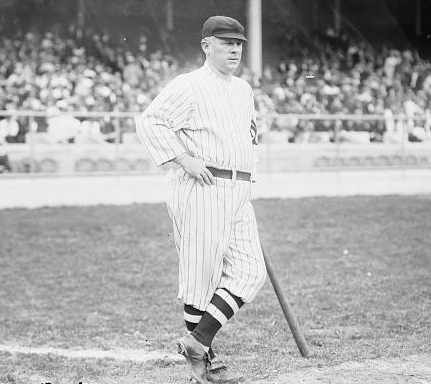 The dramatic story of Miller Huggins submitting his resignation late in the 1921 season (Ruppert refused to accept it) came from stories in two small afternoon New York papers. And the story of Roger Peckinpaugh’s inexcusable error that cost the Yankees the 1921 Series’s final game, 1-0, came from some papers that are rarely examined. QUESTION: The Colonel and Hug was a logical but inspired segue from 1921. How far along in the process of writing 1921 were you when you realized that you wanted to follow-up that work with a dual bio of Jacob Ruppert and Miller Huggins? LYLE: As I remember it, we vaguely discussed writing a second book, but never seriously discussed a topic. Steve had been researching Miller Huggins for years and pairing him in a dual bio with Ruppert seemed a natural for a book. We were actually both surprised that neither one had been the subject of a full-length bio previously. STEVE: There is a logical connection between the two books, but I don’t recall our talking about The Colonel and Hug at the time we finished 1921. It came up a year or two later, when 1921 came out. We realized that while Ruppert and Huggins are mentioned often in accounts on the early Yankees, they never had their stories told in full. LYLE: We followed the same procedure for both books. Steve wrote the first drafts for all the 1921 American League and all the Huggins-related chapters, and I wrote the first drafts for all the 1921 National League and all the Ruppert-related chapters. Those chapters that were not specifically about one or the other were divided equally. STEVE: Of course someone has to write the first draft of a chapter. But as I explained above, after countless exchanges and edits, our voices merge into one. With 1921, we split up the “first takes” by team. But with The Colonel and Hug, there was no easy or logical split, after the first few chapters (the early years of Ruppert and Huggins, told separately). So we arbitrarily divided up the chapters, since both men appear throughout. One of us would do the first draft of a chapter and send it to the other writer, who would question and challenge it on a number of levels: flow and emphasis, “word-craft,” fact-checking, grammar, etc. Big- and little-picture views. We’d have 3-4 exchanges back and forth, which really means we generated 6-8 versions. Then three of our SABR colleagues would read the manuscript and give us feedback, again big- and little-picture. We took their input and started another series of edits that we exchanged. We then gave that end product to our fact-checker. Once he returned it with not only corrections but also general input, we had a final round of edit exchanges between Lyle and me. QUESTION: Have you encountered a situation where your research of an important point yielded an inconclusive answer or a conflict in the evidence? If so, how did you resolve the problem? And while Steve, I think, has stated that you have not yet had a situation where you have reached diametrically opposed judgments or opinions on something, have you devised a plan for that situation should it arise? LYLE: Carl Mays’s integrity on the field, Jacob Ruppert’s relationship to women, particularly to a young woman who inherited one-third of his estate, and the myth of John McGraw (right) as a “small-ball” manager are a few of the events we puzzled over. STEVE: Great question, Bill. History does not always reveal clear answers, even after rigorous research. Depending on the extent to which the evidence leans one way or another, we may suggest an answer. Or we may simply present the evidence and let the reader decide for himself. In 1921, we faced the controversy on whether Yankees pitcher Carl Mays “threw” a World Series game. As much as Mays is an unsympathetic personality, we delved into the data and concluded that he probably did not toss a game. As Lyle and I grew more comfortable working with each other, we grew more comfortable challenging each other. We had a “tie-breaking” rule: if we could not come to an agreement on an issue, the person who wrote the initial draft had the final word. So in such rare instances (I can’t even think of an example), the writer who did NOT do the original draft backed off. A key to our success was a true collaboration, not simply a book whose parts were written by two authors. As with a personal relationship, when it works well, it is rewarding and enriching. But it takes more effort than a solo project. QUESTION: Both 1921 and The Colonel and Hug contain illuminating but rarely seen photographs. Who found these photos? Did you have copyright or other issues to deal with in using any of the photos? LYLE: The wonderful photos in both books are wholly attributable to Steve. Pre-1923 images are in the Public Domain, though if an institution is the only source of such a photo, it can charge whatever it wants. Post-1922 images often require licenses (permissions), assuming the owner renewed the copyright. (An exception would be a photo taken by a private party, such as a player’s relative). Some institutions (including the Hall of Fame and many libraries) have relatively low fees. Others, such as Getty and CORBIS (the former is now representing the latter, since CORBIS was bought by a Chinese firm earlier this year), have high fees, in the low three figures. I have paid that fee in rare instances, when only they had an image that I felt was vital for the book. An example is an image of Ruppert with the mystery woman in his life, Helen Weyant (to whom he left one-third of this estate) and the mystery man in his life, Fred Wattenberg. QUESTION FOR STEVE: In addition to your interest in Yankees history, you have also written authoritatively about baseball in St. Louis? Where does that interest come from? STEVE: The tragic and inspirational story of spitball pitcher Urban Shocker drew me into baseball history. Shocker starred for both the Yankees and the St. Louis Browns. I am so pleased that 18 years after I started delving into Shocker’s life, my Shocker bio will be published next spring 2017 by the University of Nebraska Press. LYLE: I became a Dodgers fan as a 9-year-old in April 1946 and remained a passionate fan until they left. I continued to monitor some of their players after the move — the ones who had played in Brooklyn — but rooted against the team. My ideal Dodgers’ season back then would have been for Koufax and Drysdale to win 60 games between them and for the team to go 60-102. When the Mets came along, many of my friends started following them, but not me. I have never forgiven the National League for allowing two storied franchises like the Dodgers and Giants to leave New York and then to replace them with an expansion team — like New York was on a par with cities like Houston or San Diego. Also, by that time I had left New York and was living in the Maryland suburbs of Washington. I took an interest in the Senators, though I was hardly a fan, and then they too left. Because I wanted my two sons to have a team to root for I started taking them to Orioles games and gradually became an Orioles fans — which I continue to be. When I decided to write my first book, I chose to make the subject one of my longtime interests, Opening Day. I wanted to cover a team from it’s beginning up to the then present time — 1996 — and in a city in whose history I had great interest. Obviously, the Dodgers, and my second choice, the Giants, were ruled out for the same reason. That left the Yankees. LYLE: I did travel (with Steve) to book talks/ signings at the Hall of Fame and in New York City for 1921, but didn’t for The Colonel and Hug. For each book we both participated in radio and podcast telephone interviews. QUESTION FOR BOTH: Steve is currently occupied with putting the finishing touches on a bio of St. Louis Browns/NY Yankees pitching standout Urban Shocker, and working on the pictorial-sports writing Deadball Era World Series book for our committee. Lyle, meanwhile, is writing a bio of ace Dodgers reliever Hugh Casey. Can you give us a current status report on these projects? And once these works are completed, can we hope for another Spatz-Steinberg collaboration in the not-too-distant future? LYLE: The Hugh Casey bio is at the publisher (Rowman & Littlefield) awaiting copyediting. I am also working on an updated edition of Yankees Openers for McFarland. The original went through the 1996 season. I am now updating and revising those years and will add the 1997-2017 openers. We have talked about a third book and are shaping and finalizing its subjects and focus. STEVE: Shocker has been copy-edited, page proofs are being finalized, and is moving through the University of Nebraska Press production process, with a spring 2017 publication date. The book on the World Series of the Deadball Era is a collaborative effort of SABR’s Deadball Era Committee of which I am the editor. It will have more than 200 photos (many rare and seldom-seen), and the text will be the words of the sportwriters of the times. St. Johann Press will publish the book in 2017. Lyle and I would love to do another collaboration. I’m interested in the 1910-1930 time-frame, a story, team, or person/persons who have been overlooked. With all the books on the Yankees, it’s interesting that we came up with two Yankees’ books, topics that had not been covered until then. QUESTION FOR BOTH: Who is your favorite figure from the Deadball Era and why? LYLE: In the late 1940s, when I was a boy sitting in the Ebbets Field bleachers and marveling over the Dodgers’ outfielders, first Pete Reiser and Dixie Walker, and then Duke Snider and Carl Furillo, there would always be a group of old men (probably in their 50s) sitting nearby who would say, in some form or other, “kid, you shoulda seen Zack Wheat.” When I got older and studied Wheat’s career, he turned out to be the quietly efficient, workman-like player I have always admired. STEVE: Wow; I love the Deadball Era and its personalities; it’s hard to pick one, or even a few. But Ray Caldwell, whose BioProject bio I wrote, is my pick. He is not real well-known, though he was an immensely talented pitcher. There’s a tragic aspect to his career, which was limited by his love of nightlife and alcohol. His Sporting News obituary said "his escapades were legendary." I also am drawn to a number of the members of the Chicago Cubs dynasty, though I am by no means an expert on them: Johnny Evers, Wildfire Schulte, Frank Chance, and Heinie Zimmerman. All colorful or controversial — or both. BILL LAMB is the editor of "The Inside Game," the Deadball Era Committee newsletter. This page was last updated November 17, 2016 at 12:35 pm MST.